Visiting the Tate Picasso exhibition recently, it hit me how ego and creativity are inextricably linked. Faced with such genius, it became obvious how maintaining the creative urge – and feeling like you’ve fulfilled it – is often a curious mix of intense intoxication and deep inadequacy. Not least because what inspires you can dwarf your own efforts. Happily, this time at least, I came away suitably inspired. It wasn’t just Picasso’s radicalism, his influence, the way he made us see the world anew that got me (though it was mainly that). What was also awe-inspiring was the vast range of styles and the sheer volume of work of which Picasso was capable. These seem like rather obvious things to point out about a giant of 20th century art. Nothing damns like the faint praise of admiring someone’s ‘prolific’ output. But the ability to just keep doing it, the habit of creativity, has always been attractive to me. And among the contemporary artefacts was an edition of the Cahier D’Arts, the bible of art criticism. Two excerpts of a 1960s essay leaped out at me. They centred Picasso’s creativity in his ability as a stylist, suggesting it was precisely his comfort in many styles that propelled him to such a prodigious body of work. I managed to sneak a couple of photos, but don’t tell anyone. This first excerpt leapt out at me: “if you have a strong enough conception of life it will not matter…whether you [paint] in one manner or another”. 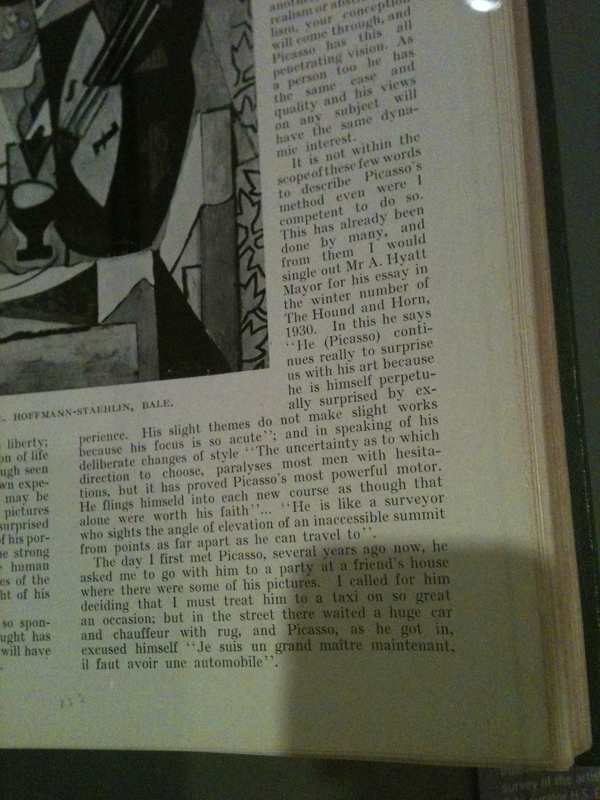 The exhibition genuinely captured Picasso’s “all penetrating vision” and made it clear the adopted style was secondary. For many artists the style is their identity; for Picasso it was merely the means to a more expressive end. Reading this was a revelation. It hit me that a style, or an approach, is only that – merely a way to arrive at the problem. ‘Flinging ourselves into each new course’ is what allows us to make the approach work, not the approach itself. We can’t all share Picasso’s genius, but we can all practise the art of committing fully. It shows again how critical it is simply to start, and to keep on starting. Procrastination, not inability, is the killer of creativity. We need to pick a form, or a process, and trust in it. Submit to it. If it turns out to be wrong, very well. Chances are something will have come of the attempt, and last time I looked something is still better than nothing. True creativity, I think, is habit. It isn’t self-conscious. It doesn’t worry about being wrong, or looking silly. It wins out over self-doubt. The day after Picasso I was listening to David Bowie’s Low. I feel I should add that this is not an uncommon occurrence. The radicalism of Side 2 struck me, in contrast to the music of Bowie’s career so far, and to the music on Side 1 of the same album. A true stylist, Bowie’s music isn’t dependent on sounding like Bowie. Its innate Bowie-ness will “shine through”, just as Picasso’s vision does whether he’s sketching or painting, aping the Impressionists or stretching the limits of Cubism. Equally, Bowie trusts in his chosen forms – it’s probably what made Low possible. He was coming off the back of a period of writer’s block, so Side 1 is full of fragments and broken English because that’s how he felt. Side 2 was constructed, rather than written. Bowie and his collaborator Brian Eno actively chose to discard work that was well-realised, but familiar. Instead they looked for the accidents and mistakes from which they would build new ideas. That was their chosen MO and they stuck to it, and in so doing they uncovered work they would never had got to otherwise. I love the boldness of this approach. A huge star with writer’s block still has the the confidence in his process and his artistry to actually throw stuff away in search of innovative work. He doesn’t really know what he wants, but it needs to be new. Sounds like something we could do with in advertising. We’re not artists in advertising, of course. We don’t follow a muse, or have to rely on our own motivation in the same way. An artist’s decision to adopt a new style is to create stimulus or constraints. Our stimulus is set for us (the brief), so we have something to react to. In advertising, though, we also have to keep someone else happy. The brief often comes with a deadline, and we frequently have to work hard against our instinct to find ‘the’ answer, as quickly and efficiently as possible. Why work against it? Because there isn’t always only one answer. And because better answers come from finding new ways in to the problem. And because making a habit of digging deeper helps make innovation a habit too, rather than something we’d like to aim for now and again. What worked for Bowie/Eno was just to keep going. What might seem entirely profligate (discarding good work) is actually a potent way of uncovering untapped ideas. David Shrigley recently came to speak to MEC. He told us that he only ever keeps 25% of anything he makes. I wondered about the impact that has on your mindset not just after the creative process, when you’re editing.but during and before it, too. If you know ¾ of what you make will eventually be binned, the filters come off. You are freer just to get stuff down on paper, and more able to worry less about it being ‘right’. Anyone who’s been in a brainstorm or idea workshop knows the obvious needs to be extracted quickly to get to the gnarly and sometimes scary job of suggesting riskier, less heard/thought ideas. You may not be actively prioritising the mistakes, like Bowie did, but you’re setting the conditions for surprising ideas to emerge from further within your mind, and from the group. You’re also less likely to be easily satisfied with what you come up with. I suspect a lot of us in advertising are quite self-satisfied. Putting undue pressure on ourselves is clearly A Good Thing, even though it might be uncomfortable. What I like about the Bowie and Shrigley models is that they aren’t precious in any way. They acknowledge the reality of creativity – that a lot of you what you come up with will be rubbish – and thereby detach the ego, at least for the important bit. I received another lesson in this approach when I met Bill Buxton recently. I was lucky enough to be invited to a dinner at which Bill spoke, by Microsoft (where Bill is principal researcher). 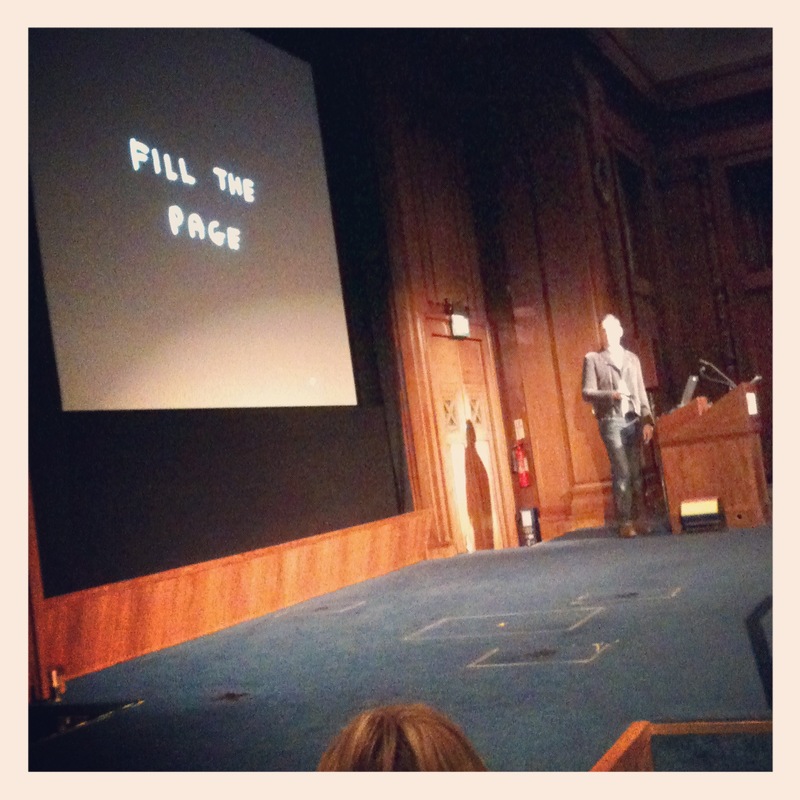 He spoke eloquently and widely about technology, design, creativity, music, computing and, er, canoeing. Before dinner I found myself in conversation with Bill about UX and sketching. Turns out he has a profound belief in sketching as a principle. Not just pencil drawing, but a more generic approach to low resolution prototyping. This could encompass photography, modelling, CGI, video, whatever. He’s even written a book on it. He went on to tell me that he instructs his teams not to come to him with proposed solutions unless they have seven – yes, seven – different designs to share. Not only that, but they had to be seven different solutions about which you felt equally positive (or negative). Having one obvious winner and six less favourable options was not a way round this. Why was this? Partly the focus on such a broad output from each team member yielded far greater opportunity for new ideas. But the real reason was it made the evaluation of ideas more constructive. As the designer you’re more likely to defend those ideas you like, with a less objective eye. As the team leader it’s very difficult to evaluate the design without making the designer feel implicated – if you’re judging across a team egos need to be left at the door. Being obliged to have seven ideas makes it almost impossible to have a favourite. So what can we do with all this? Here’s some of the methods I’ve tried to apply to the way I work. They’re not exhaustive, but as this is all stuff that’s been flying round my head for a while, I’ve found it helpful to organise it into something (hopefully) coherent. Find 2 or 3 approaches to a creative problem that never fail to get you started. Whether it’s just you or a group, try to get used to techniques that you can throw into the mix that just get things moving. I always find a book, ask someone to pick a page number at random and read out the first word. Then I people to word associate till I have 5 or 6 words, which become the springboard for answering the question on the table. Totally arbitrary, and gives everyone permission to disown their first thoughts – a crucial step in leaving the ego behind. Don’t just do the usual. Making creativity a habit doesn’t mean allowing routine to seep in. Get out somewhere. Find a different location. Use different people. Work in a different medium. Only draw your ideas. Give yourself a time limit. Whatever it is, it doesn’t matter – creativity requires constraints and new contexts, so create them for yourself. Define ideas more holistically, but develop more of them. Somewhere between the level of post-it vagueness and finely honed engagement idea is a world of lost opportunities. We all know the difference between a potent post-it idea and a dull one – get in the habit of sifting good stuff as you go. Make the 60 seconds’ worth of effort it takes to work out whether you can extrapolate something interesting/huge/rich out of the good ones and seeing how else you could build on them. I love the work that John is doing in this space. Practice facilitating groups as well as being part of them. It’s hard investing of yourself in service of an idea while remaining dispassionate about its qualities. Acquiring the skills of being a participant well as a facilitator keeps you leap seamlessly from big picture to critical detail in the moment. Knowing how to continue ploughing a particular creative furrow while ensuring the thinking remains clear and relevant. Look for the stuff that everyone else takes for granted. There’s a great Eno quote about what Bowie was reacting against with Low. “Nobody wants you to step off the tracks and start looking round in the scrub around the edges because nobody can see anything promising there.” What is everyone discarding that could become invaluable? What’s happening at the extremes? What always comes up that has become wallpaper but with fresh eyes might reveal new potential? Risk feeling inadequate. Most of this post is based on recognising the parallels between people I admire, in different fields (art, music, technology) and being inspired by it. But sometimes we don’t like to, because brilliant people can be intimidating. We can also worry about other people thinking we’re weird for trying new stuff. We shouldn’t. Any agency not rewarding/enabling this kind of behaviour should be viewed with disdain. (The current series of Mad Men portrays genuine creative ambitions in acting and writing looked down upon by people who don’t understand them, and I’m not always convinced we’ve come that far). Don’t fear an idea changing. ‘Eureka’ moments can be as misleading as they are exciting. Perhaps the best image I know is (I think) Wittgenstein’s rope of multiple overlapping threads. None of the threads extend over the rope’s full length, yet they still form a single cord. Ideas can emerge in such a way that the final thought might not have even made contact with the first, but the chain is what gets you there. Always think about how each idea could be a platform to the next (and possibly better) one. Writing this, I’ve started to see how balancing instinct and persistence is central to the creative impulse. Like with Bowie, whose songs would form their identity by discarding the elements with which he’d begun. Or Shrigley, who knows that creativity is about pushing though and editing later, because the long haul is as important as the flash of inspiration. Or like with Buxton, who knows that designs can only be collaborative if individuals are happy to let go of their own stuff. 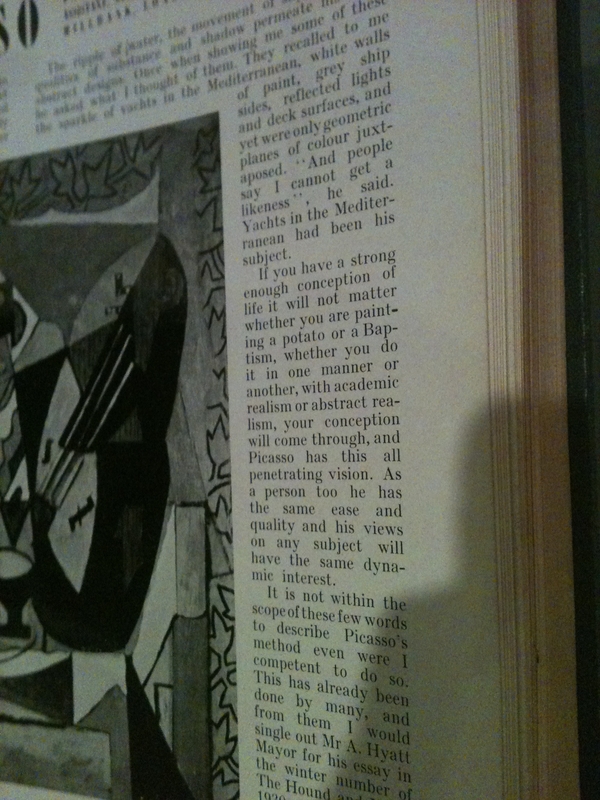 Or, of course, with Picasso, who knew that being prolific was the key to articulating whatever it was you wanted to say. I mean ‘really’ – sorry for then typo! Hey thanks, Anjali. And Bill was great. Musician-turned-computer-scientist-turned-designer is one of those career combos you rarely get to meet. Great story-teller. Excellent read James. I have a soft spot for Bowie’s Low album and it’s amazing how he crafted an album that was such as radical departure from his last. I think there’s rich ground in the difficult followup work angle! Thanks for the comment, Tom. Good point on follow-ups. Getting started is one thing, staying committed something else!